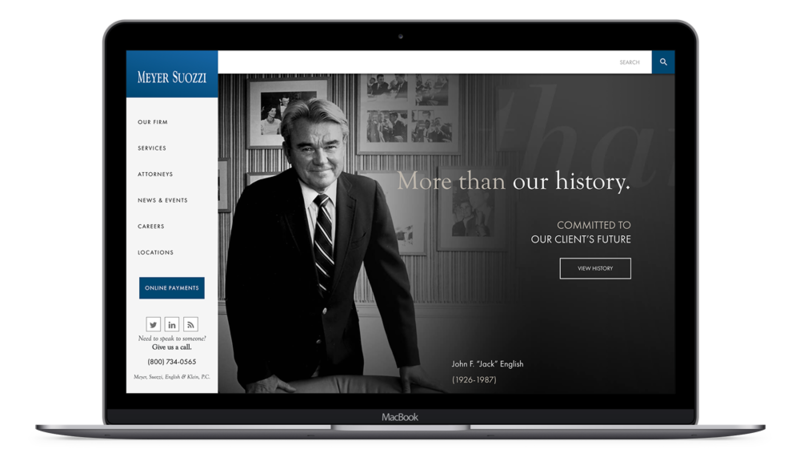 The prestigious law firm Meyer, Suozzi, English & Klein needed a polished brand and web presence that represented their dedication to unparalleled excellence. In rebranding Meyer Suozzi, it was essential that we preserved their character and unique history while modernizing their online presence. We chose a clean and sophisticated serif font that is highly legible, yet elegant in large headlines. To complement the headline style and modernize a historical brand, we introduced Goudy Old Style, a more classic and sophisticated sans serif font for the body copy. We were tasked with modernizing the Meyer Suozzi brand while honoring and upholding their history. Our challenge was in balancing a bold and influential historical legacy with a modern and intuitive user experience. It was our pleasure to showcase the very best of Meyer Suozzi’s past while modernizing their brand and website for their audience today. Our goal was to preserve Meyer Suozzi’s legacy while bringing them into the modern digital world. In collaboration with the law firm’s dedicated marketing team, we developed a contemporary brand to honor the law firm’s past, while looking towards the future. Our team restructured practice areas, built an intuitive attorney directory, and strategically outfitted the site with the level of depth needed to convey the law firm’s ample accomplishments. 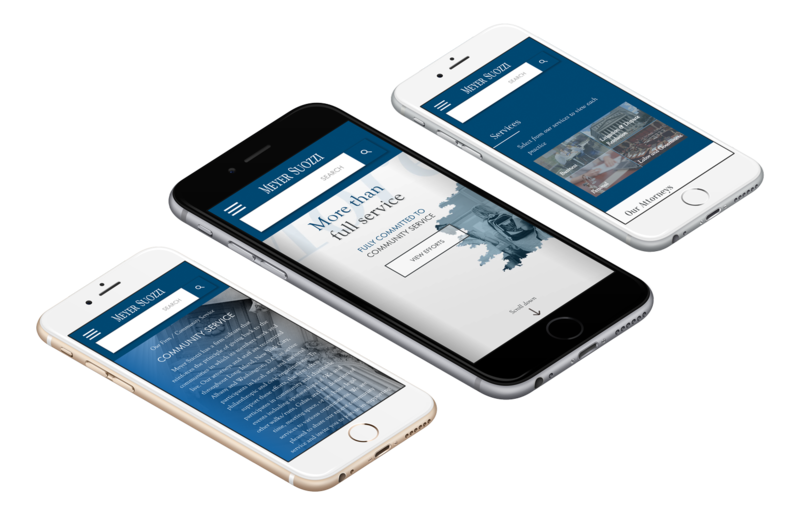 We designed a seamless mobile experience for users with a strong introduction to the Meyer Suozzi law firm and brand, an intuitive attorney directory, location finder, various entry points for contact and trending news articles.